I can finally offer what I consider the best end grain box tool available to woodturners. It allows you to cut cleanly across the end grain and to leave a clean square corner with very little or any sanding. This tool evolved after extensive research into how woodturners during the last two centuries have solved the problem of hollowing out the material from the inside of hollow wooden objects. The methods varied quite markedly from the hook type tools of the Japanese and northern Europeans to the various forms of scrapers of the British. The BHT has strong links with the hook tools, but, because of its unique shape it is much less aggressive and with it's small radius at the tip it has the ability of creating sharp clean corners in small to medium sized boxes. The BHT is best used in hollowing into end grain but also performs in side grain very well. 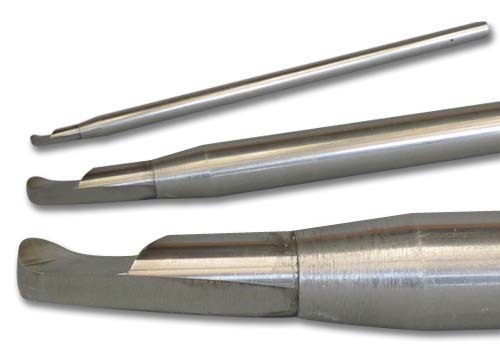 In larger turnings the tool performs very well as a fast remover of material. The standard tool with the 7/16th inch stainless steel shaft and 5/16th inch M2 HSS cutter should be set 4 inches into a wooden handle of 14 to 18 inches in length. With this setup you can hollow to around 4 inches in depth. A must for any woodturner to add to his or her collection of turning chisels on the wood lathe. Make your own handle or just fit into an old handle you have kicking around. Comes complete with the sharpening jig but you will find very rarely do they need sharpening. I find a diamond lap stone is all that is needed. The bevel of the tool needs to be rubbed for best results. This is designed as a cutting tool not a scraper. Click the button below to add the Soren Berger Box Hollower unhandled to your wish list.